Hopefully everyone gets their fair share of Tricks and Treats. From all of us at TGN and CMON we hope you have a fun and safe Halloween! 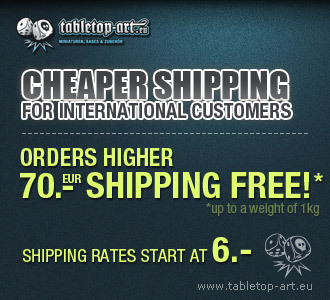 Due to growing international requests in our products , we have a new module in our Shop for calculating the shipping costs for every order individually. Irrational Number Line Games has their final Halloween themed Idea of the Week, a genre-independent werewolf and vampire supplement up for free at Wargame Vault. Yes, more vamps and wolvies … but its short, free and (we hope) different enough to poke a little fun into your game. 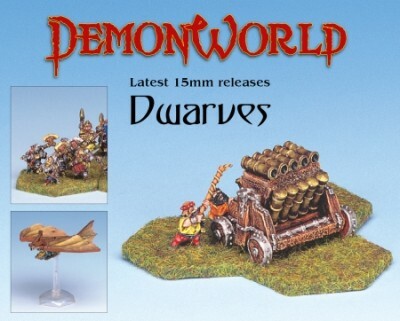 The first batch of 15mm Dwarves are up on the site now- more releases to follow soon. New video review for the two player war game from Z-MAN. By Board to Death TV. A new (unofficial) Army for Warhammer Fantasy Battle - they emerged from the mists ! Fimir were a somewhat mysterious part daemonic race that existed way back in Warhammer mythology (up to the 3rd edtition). JanvanHal from the Battle Reporter forum has done a fine job resurrecting them. A new unofficial Warhammer Fantasy Battle army book pdf and this one is a real treat. The book draws heavily on Viking lore for it's inspiration and the army has been expertly tested and balanced. Screaming Heretic Ep 13 is released! The latest issue of Miniature Wargames, the much awaited Darker Horizons sci-fi & fantasy wargaming special, is back from the printers and available to buy from all good newsagents or online from Wargames Fever. Following up on a very succesfull Kickstarter Campaign, Impact! 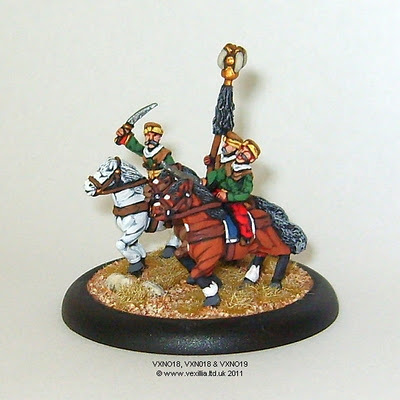 is pleased to release the full Scotling miniature set. This 14 figure set features a Scotling Caber Team along with flavorful characters such as Flash, Scratch, Drink, Rage, 'Ave It and Flying Kick. 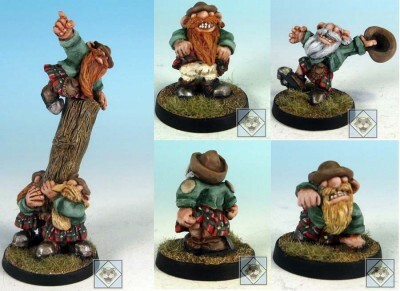 These miniatures would work perfectly as Halflings or Dwarves. Freebooter have released the latest Amazon for their Freebooter's Fate game. 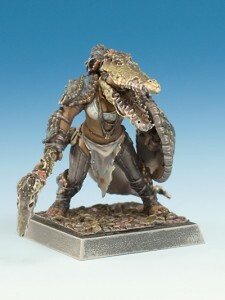 The lady in question, called Occepa, is a tough close-combat fighter, clad in crocodile armour and built like a proverbial Australian house. She was released at Spiel Essen earlier this month and is now on general sale. For a limited time we are offering a £5.00 sample pack containing figures selected at random from the 32 packs in this exciting range. The pack can be ordered from the main page only. Today sees the next mission of Greg Rumbles hugely popular Arc for Firefight 2.0 being published on Barking Irons Online. Whilst both the above were designed for Firefight 2.0 they can be used with almost any skirmish level sci-fi ruleset. We have a new web site. I had to switch over to a new site because the old site, which hobbled together in raw HTML, was too difficult to maintain. The new site is written with the Drupal content management system, which makes maintainance a doddle. We have just shipped a wave of 2 new Anima Tactics figures to our distribution partners. Two new Black Sun figures come out to play for Halloween. Deimon is the personal valet and head of security for the Steiner family, major share holders in Black Sun along with the Delacroix’s. The Type-012 is another undead/bio-weapon to add to Black Suns growing arsenal of monstrosities. The Type-012 came out looking better than I ever could have hoped, lets hear it for Ben Misenar and Angel Giraldez! Coming soon for Pulp City - Doom Train!. This evil engine of destruction is a Level 2 Supreme for the Necroplane Sub-faction. The first 1/56th scale Gear Krieg combat walker kit, the US M11 Combat Walker “General Early” will be available as a pre-order at Fall-In! at the Brigade Games dealer booth. The General Early is the first in a series of Gear Krieg combat walkers and sci-fi WW2 figures and accessories that will be released for 28mm wargaming. The kit includes the combat walker, turret and weapons accessories, as well as legs for both “walking” and “driving” modes so you can model your combat walker the way you want to. We offer a flat rate of £1 GBP per order worldwide, with any order over £50 GBP being sent free of charge. Finger and Toe Models announces the release of the 28mm card stock MULTI-STORY RUINS. Designed to go with Finger and Toe’s MULTI-STORY WAREHOUSE, MULTI-STORY RUINS comes with three ruins: a one, a two, and a three story ruin, plus a large crater, rubble pile, barricades made from wire, rebar, and junk, plus stacks of tires filled with dirt for hasty fortifications in the streets. 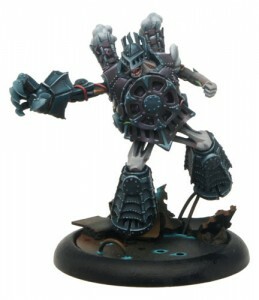 Kitbashers can even build their MULTI-STORY WAREHOUSES as shells that slip over the MULTI-STORY RUINS. Like the other models that comprise the warehouse district, MULTI-STORY RUINS can be used across a wide range of time periods and genres. Combine with Finger and Toe’s RUINED FACTORY and KARTAGRAD, and you begin to get a huge variety of inexpensive terrain representing a devastated city that can easily cover a table, giving even grizzled veterans the willies as they creep from cover to cover avoiding snipers. Remember, every Finger and Toe model comes with SMOOSH ASSURANCE: if ya’ll smoosh your MULTI-STORY RUINS, a new set waits your summons from hard drive and printer. MULTI-STORY RUINS is available from http://www.rpgnow.com or http://www.wargamevault.com for $6.50. Loup-Garou. (Box with 4 male figures). 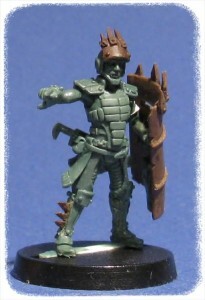 A new multi-part unit box providing all remaining weapon options of this fearsome Merovingian troops. If the Loup-Garous are capable to fight and stop the Dog-Warriors riots, with their Viral Special Ammunition… do you dare to imagine what they can do against any enemy of Ariadna? Nisses (MULTI Sniper Rifle) Unfortunately for her enemies, the longly awaited PanOceanian fan-favourite Nisse Sniper has arrive to the battlefield. 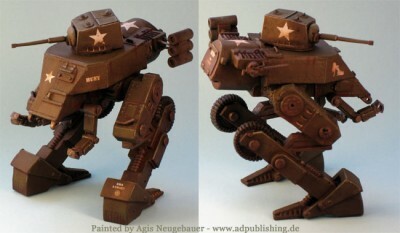 This troop joins a long range weapon with a good BS Attribute, the Mimetism Special Skill and a Multispectral Visor L2. The Nisses don´t fear the storm, because they are the storm! 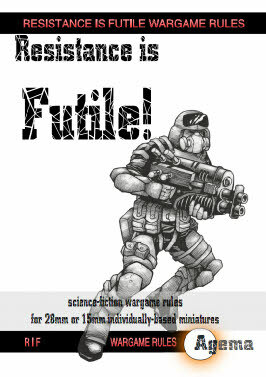 Agema has released a brand new set of science-fiction wargame rules ideal for use with 28mm figures! The aim is to provide fast-paced games which flow well but maintain interest by using snazzy game mechanisms! They're available in a print version or as a cheaper pdf download off Agema's website. 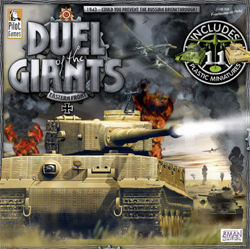 Some older wargame rule sets are also now available here as pdf downloads for the first time.